A high school teacher drowned during a youth retreat event at Masagana Falls in barangay Irawan on Sunday morning (October 15). The man was identified as Khyme Hikilan, a MAPEH teacher at the Sicsican National High School and a resident of the Golden Valley Subdivision. He was only 28 years old. According to the Puerto Princesa City Police, Hikilan was in the company of his students and some parents and they were at Masagana Falls to conduct a three-day youth retreat camping event. 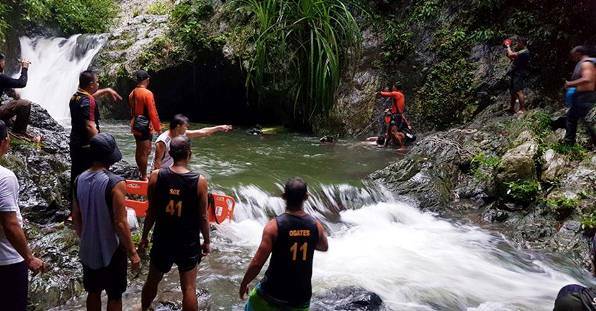 According to the police report, during a swimming session, several of the students were being carried downstream by the river current when Hikilan jumped in to rescue them. It was then that he was carried away by the current. Hikilan's lifeless body was retrieved several hours later through the combined efforts of volunteers, concerned citizens, the Philippine Coast Guard, the Bureau of Fire Protection, and the Philippine Navy. The search started in the morning until late in the afternoon. Rescuers had to use oxygen tanks because Hikilan's body was stuck in a deep portion of the river. Photo credit: Puerto Princesa Police Department. Students, friends, family, and acquaintances of Hikilan wrote messages of condolences when the story broke on social media. A certain Jabel Nunala wrote: "We know you are in a better place and one day we shall meet again. In our hearts, you will always be. Your love, your voice, your smile are forever imprinted in our minds. Goodbye for now Sir Khyme."